Early morning tides roll in on the Pamlico Sound. When Todd BenDor was a kid, a bunch of rowdy teenagers poured salt all over his best friend’s lawn. Not surprisingly, the grass died. Today, BenDor, whose research was recently cited by President Obama, works as part of a team studying saltwater intrusion — the movement of saltwater from the ocean to the freshwater coastal plain — around North Carolina’s Albemarle-Pamlico Peninsula. The NSF Coastal SEES (Science, Engineering and Education for Sustainability) collaborative project brings together researchers from East Carolina University, North Carolina State University, and Duke University. But not all life can sustain itself here. Saltwater intrusion can affect the drinking water, lead to flooding, and change the composition of the ecosystem — like crop and timber yields, animal life, and natural filtration. It even affects the economy, as timber companies, agricultural operations, commercial fishing, and outdoor recreation businesses abound on the peninsula. All is not lost, however, as the saltwater intrusion has yet to become bad enough to cause such drastic changes. That’s why BenDor and this cross-functional team of scientists are studying the problem now. 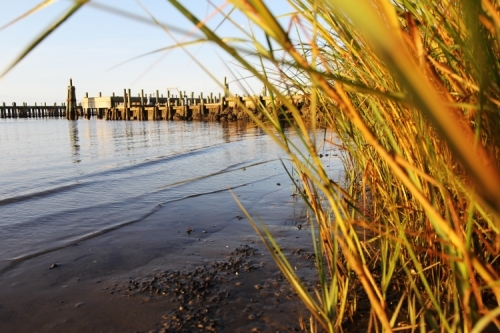 The five-year project, which began in January 2015, will develop a toolset to teach the Albemarle-Pamlico community about saltwater intrusion, present the possible outcomes it can lead to, and suggest a plan on how to sustain the coastal plain moving forward. So far, the team has installed monitoring stations to accurately gage sea level rise and salinity at several locations along the coastal plain including the Alligator National Wildlife Refuge and Goose Creek State Park. 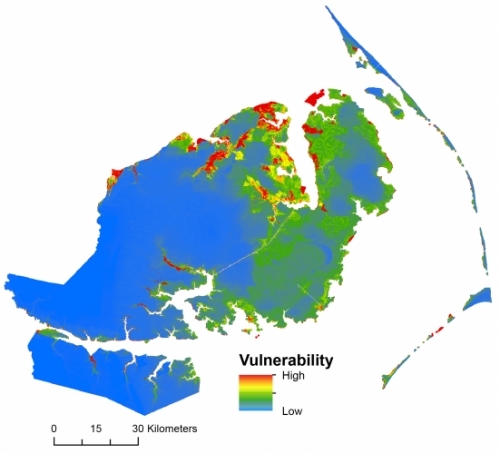 They’ve also developed a Saltwater Intrusion Vulnerability Index (SIVI) to assess the level of saltwater intrusion risk. SIVI takes elevation, proximity to saltwater sources, and water characteristics into account. “We’re trying to figure out how the coast actually processes saltwater,” BenDor says. The Saltwater Intrusion Vulnerability Index (SIVI) determines saltwater intrusion risk based on elevation, proximity to saltwater sources, and water characterstics. BenDor’s role in the project involves the social science behind saltwater intrusion. “I’m looking at how it’s impacting people, and how people are impacting it,” he says. He and his PhD student, Kristen Vitro, are surveying the Albemarle-Pamlico population — specifically residential landowners, land managers, and community stakeholders in the areas that are subject to salinization risk. Todd BenDor is an associate professor and director of the PhD program in the Department of City & Regional Planning at UNC-Chapel Hill. Kristen Vitro is a UNC-Chapel Hill PhD student in the Department of City and Regional Planning.